Hello all, there have been a lot of changes happening in my world, and thus, I haven't been blogging a bunch. But i wanted to share with you my very first attempt at mixed media. I started with a bunch of stickers that had motivational type vibes to them, but that also made me think about being compassionate. Most of them were from MAMBI (from their Happy Planner line) and then I randomly (but very straight) stuck them on the paper. Then I covered it all with a good layer of White Gesso. I didn't even know what this stuff was, but I knew I was supposed to use it! (Hint: it's actual function is sorta that of a primer. Go figure.) Then I let that dry for a bit, probably not long enough, because they OTHER issue with my crafting is that I'm a "get it done" kind of girl. .....aaaannnndddddd........ mixed media stuff takes time to dry and layer and all of that.... whew, I'm way out of my comfort zone here. THEN, I took a stencil (from Gina Marie Designs) and a palette knife and I used a little texture paste and a little molding paste and I scraped it across the stencil. Then I repositioned the stencil and did that a few more times. After that dried a bit, again, not long enough.... then I took some water and spritzed my whole paper and used some Distress Oxide inks and a paint brush and added some color around the white parts to jazz it up. This time I really did let it dry... and I put it under something heavy so that the page didn't curl up. When it was all dry I went to my cookie jar.... yup, cookie jar... but MY cookie jar is filled with flowers from Wild Orchid Crafts and I grabbed a fistful and set to making little bunches of flowers all over the page. i also found some of my little wooden accents, the little arrows, and put them on the page.... lastly..... 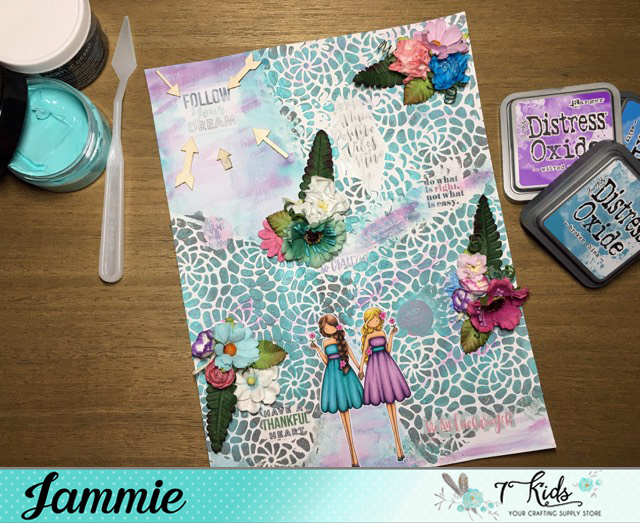 I colored up the Gemini stamp from Stampin' Bella (which I buy all of from the 7 Kids Crafty Supply Store) and fussy cut them and then adhered them to the page! Done and done! I'm really pleased with how this came out, especially for my first attempt at mixed media! Hope you all like it too! Thanks a bunch for looking! Have a wonderful week. Tootles! I love this Jammie, you did such a beautiful job! Awesome job Jammie, you are so talented!! Hoping to learn a lot from you this year.